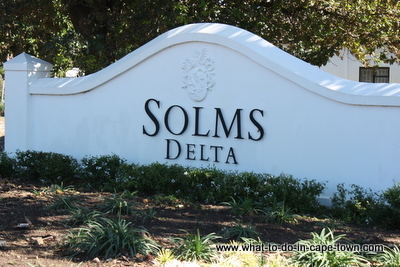 Solms Delta Wine Estate is the result of world-renowned neuroscientist Professor Mark Solms's passion for his European roots blended with traditional Cape Traditions. Solms-Wijn de Caab wines consist of Rhône-style blends with desiccated components. 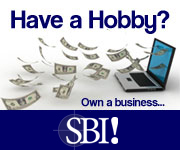 A fusion of tradition and creativity. 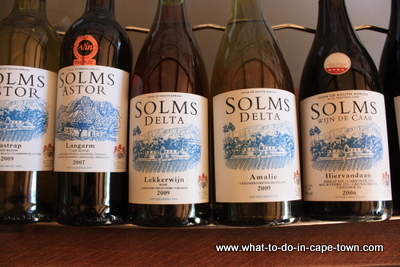 Solms-Hegewisch wines are made entirely from desiccated grapes. Solms-Astor wines are lighter party wines, made from the more traditional Cape varietals. 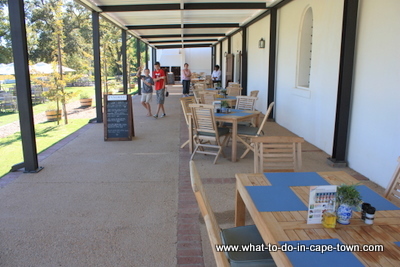 Fyndraai Restaurant offers a modern take on traditional Cape cuisine whilst showcasing the history of the area. 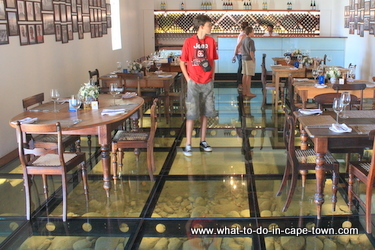 Fyndraai is built into the site of the farm's original wine cellar, and upon entering you step onto a glass floor exposing the original foundations, uncovered during archaeological diggings. Picnic baskets are available to enjoy at private picnic spots which are spread out along the estate's riverside forest. There are safe areas for kids to swim and for Dad to do some fly fishing! 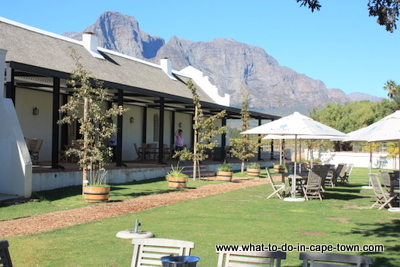 Solms Delta Wine Estate page. The lives of the Cape’s first settlers, the Khoi, revolved around some 400 plant species that nourished them and cured their ailments. Most are now under threat of extinction. When Fyndraai Restaurant opened on the estate, its brief was to pull exclusively from the Cape’s genuine food traditions. Afrikaner boerekos (18th Century Old Cape fare influenced by Dutch, French, German and Slave practices), was mixed with ingredients first used by the Khoi nomads who settled in the Franschhoek valley 2000 years ago. The need to preserve this veldkos was the genesis for the Veldfood Garden. 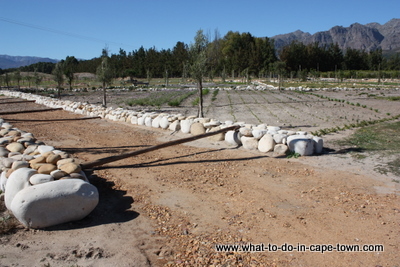 The 2-hectare veldfood garden is now planted with edible plants cultivated for use in Fyndraai’s kitchen. Led mainly by farm residents, the tours offer personal insight into the vineyards, farm workers and cultural and musical heritage of this estate. 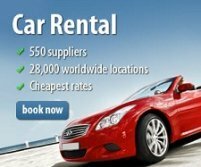 All these guided tours include wine tastings. 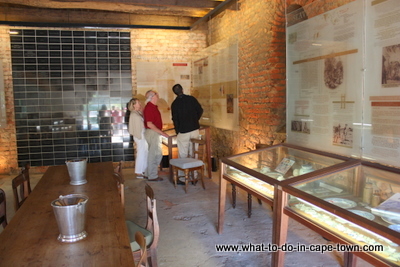 The Museum van de Caab is an oral history centre for the workers on the farm and the surrounding farm communities. It represents all voices - even that of the owner. This allows a story to emerge that is authored by the inhabitants themselves, as they discuss what is meaningful and important in their lives today, and describe how they feel about the past.